WHEN: Thursday, June 2, 2011 from 6:00 - 8:00 p.m.
CLARKSDALE, MS (May 27, 2011) - The Delta Blues Museum will host a CD release party on Thursday, June 2nd in Clarksdale, MS, at Ground Zero Blues Club from 6 - 8 p.m. to celebrate the release of "From Clarksdale to Kansas City, Vol. 1," the first CD featuring the museum's own student band. The event is free and open to the public. 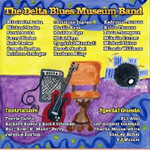 The Delta Blues Museum Band will perform, and the student CD will be available for purchase. The twelve-track CD sells for $10. After the party, Ground Zero Blues Club will host an open mic night, with a $3 cover charge beginning at 7:30 p.m.
All proceeds from CD sales will directly benefit the museum's long-running music program. The Delta Blues Museum Band is part of the museum's arts and education program and teaches students to play music in the traditional way music has been passed along from musician to musician, from one generation to the next. For the CD project, notable talents like Charlie Musselwhite and Mississippi Artist Roster musician Bill Abel became guest instructors at the museum, teaching young musicians the rudiments and foundations of blues music and passing on the traditions of this important art form for generations to come. The project allowed instructors the chance to educate students on the history of other blues musicians, such as Robert Johnson and Muddy Waters, and to demonstrate the importance of copyright and licensing-instructors also incorporated Sam Phillips' Memphis Recording Studio and its evolution into Sun Records (thanks to the recording of "Rocket '88" by a group of musicians from Clarksdale). Well-known blues musicians and mentors for the band appear on the CD, including Musselwhite, Abel, Bill "Howlin' Madd" Perry and Daddy Rich. The recording, made possible by a grant from the New Hampshire Charitable Foundation, showcases blues favorites as well as one original composition on one-string guitars, hand-made by the students under the instruction of Abel. Musselwhite taught harmonica to the no-age-limit class and offered a lesson not only on technique but also on the skill of listening. Both Howlin' Madd and Daddy Rich are full-time instructors. "Teaching at the Blues museum has been as rewarding for me as it has been for the students," offers Daddy Rich, adding, "The release of the student band CD is another great step for perpetuating blues music into the future. I hope to see more CD releases from the students of the program for years to come." The CD was recorded at Vincent Productions in Clarksdale. The Delta Blues Museum is dedicated to creating a welcoming place where visitors find meaning, value, and perspective by exploring evolution of the unique American musical art form of the blues. The City of Clarksdale, located at the intersection of Highways 61 and 49 ("the crossroads"), and the surrounding Delta region are known as "the land where the blues began." Since its creation, the Delta Blues Museum has preserved, interpreted, and encouraged a deep interest in the story of the blues. Established in 1979 by the Carnegie Public Library Board of Trustees and re-organized as a stand-alone museum in 1999, the Delta Blues Museum is the state's oldest music museum. The Delta Blues Museum Stage serves as the main venue for local festivals such as the Sunflower River Blues and Gospel Festival in August and the Juke Joint Festival in April.